This large importer brings plywood to the United States from Eastern Europe. The mill cuts the material into 4’ x 8’ pieces—the standard size for the American market—and then stacks and bands the sheets on 4’ x 8’ skids. I.C.E. Transport arranges over-the-road (OTR) transportation from the mill to a seaport, books ocean transportation to a port in the US and then handles OTR transportation to the consignee. End customers include plywood distributors, furniture manufacturers and other businesses in multiple states. About 10 years ago, this importer had a challenge. The company was losing sales to competitors that bought plywood from different mills in Eastern Europe, for less money. Because those competitors bought for less, they could also sell for less, making their products more attractive to American buyers. There was no shipping solution that could help with the price of the actual goods, but smarter shipping could help reduce the total import cost per unit. What’s the maximum container payload? To find opportunities to save, I.C.E. Transport looked at how this customer loaded its 40’ containers. Like many shippers, the plywood importer believed for years that containers could carry only up to 44,000 lbs. Actually, the only limit to container weight on the ocean is the maximum gross cargo weight listed on the container door. The legal limitations occur on the land side, where weight restrictions on roads in the US limit the total weight to 80,000 pounds for a standard tractor-trailer. But if OTR carriers have the right permits and equipment, you can put as much as 55,000 lbs or more in a 40’ ocean container. So, the company could legally add 10,000 lbs. more plywood to the container payload. But how much more product could actually fit into the box? That’s not a simple question. Plywood isn’t water: you don’t just pour it in until it reaches the rim. I.C.E. Transport had to work with our customer, and use our stow planning software and know-how, to devise a load plan that maximized container utilization. To put the solution into action, the importer looked upstream in its supply chain. It asked the mill to add extra sheets of plywood to each skid, making each unit of the load a little taller. This let the company fill more space at the top of the container. Of course, the importer also made sure that employees, both at the mill and at customer facilities, could handle the extra weight safely when they loaded and unloaded. Then the focus turned to a trickier piece of the puzzle – the space that doesn’t get filled when you lay skids of plywood flat in a container. 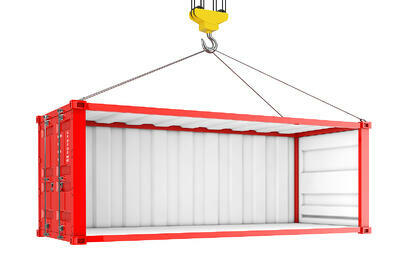 A 40’ ocean container is about 7.5 feet wide. So you can’t place two 4’ x 8’ skids side by side on the floor, nor can you turn the skids sideways to fit more of them down the length of the box. Load a bunch of 4’ x 8’ skids in a container, and they’ll leave you with an empty space about 40 feet long and 3.5 feet wide. If you’ve ever packed books into cardboard cartons, you can picture what the stow planning software told us to do. Just as you’d turn some books on edge to fit a few more into the carton, this plywood importer asked the mill to turn some skids on edge to make better use of the space at the side of the container. I.C.E. Transport found a trucker with the authority and capacity to haul heavy loads from the mill to the port in Europe. We also located carriers in the U.S. to take the heavy loads to their final destinations. Using this strategy, the customer has been loading ocean containers with 55,000 lbs. of plywood for more than 10 years. Its cost for shipping one of these containers on the ocean is exactly what it would pay to ship 44,000 lbs. It’s like moving 10,000 lbs for free. Because the company has to use heavy-load carriers on land, it pays a bit more for truck transportation. But, overall, fitting more product into a container saves a great deal of money—$40.95 on every metric ton. Based on total shipping volume, that comes out to a $93,000 a year savings. This strategy not only saves the importer money, but also puts it on an equal footing in the U.S. market. While the company might pay more than competitors for products, its total cost to supply a sheet of plywood—material plus transportation—is no higher than anyone else’s. By increasing container payload, this importer can match its competitors’ prices and gain more sales. What’s the solution to your payload puzzle? For shippers who want to reduce per-unit costs, every product presents a different challenge. There’s a lot to gain if you can find the right solution. Don’t go it alone. Work with an expert in containerized and heavyweight shipping to develop a winning strategy. It will save you money, and it might even win you more sales.